Milos Island - The definitive tourist guide portal to the island of Milos, Cyclades, Greece, an idyllic vacation travel destination. The Milos Island website is the definitive tourist guide portal to the island of Milos, Cyclades, Greece, an idyllic vacation travel destination. 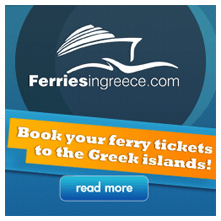 It includes information on Milos Island with photos, videos, maps, beaches, hotels, rooms, apartments, studios, restaurants, history, sightseeing and activities. Milos is largely an undiscovered island, with perhaps the most interesting coastline of any other island this size in the world. 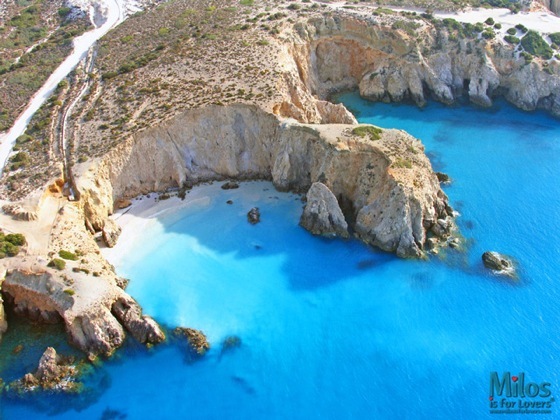 A volcanic island, Milos is known as the island of colors, mainly because of its spectacular, colorful rock formations. Milos is the southwesternmost and 5th largest island of the Cyclades archipelago, only 3-5 hours from Athens by ferry, or 30 minutes by aircraft. Milos Island is located west of Santorini, right between Heraklion, Crete and the Greek mainland. The 5,000 inhabitants of Milos Island earn their living primarily through tourism and mining, and to a lesser extend through fishing, farming and agriculture. Milos is also known as "The Island of Lovers" because it is the discovery site of the famous statue Venus de Milo, the ancient Greek Goddess of Love and Beauty, and every summer and especially during the month of August it is the favorite destination of thousands of young and not-so-young lovers. Milos island has few visitors in June and September, and is practically deserted in April/May or October/November, even though the weather is still quite good. 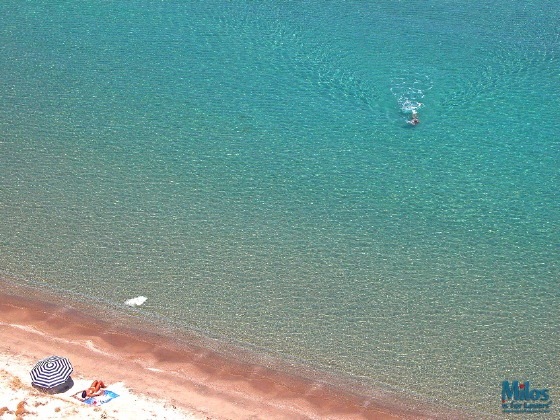 Some of the best accommodation establishments in Milos are featured in this Milos Island guide. The Milos Rooms page includes information on hotels and rooms to let that offer rooms, studios, apartments in the areas of Adamas, Embourios, Kaminia, Klima, Mytakas, Pachaina, Paliochori, Parasporos, Plaka, Pollonia, Provatas, Sarakiniko, Triovasalos and Zefyria. 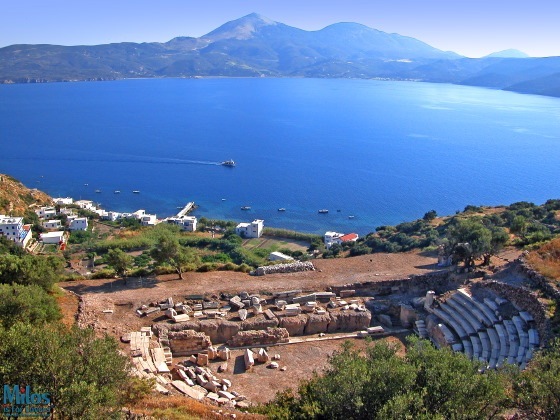 Milos island is proud of its fascinating history. The famous statue of Venus de Milo was discovered here in 1820, its early-Christian catacombs are older than Rome's, the ancient Greco-Roman theater is among the few marble theaters in Greece with such a magnificent, elevated view, and the island boasts of an 11,000-year mining history. Most exhibits in the Cycladic wing of the National Archaeological Museum in Athens are findings from Milos Island. 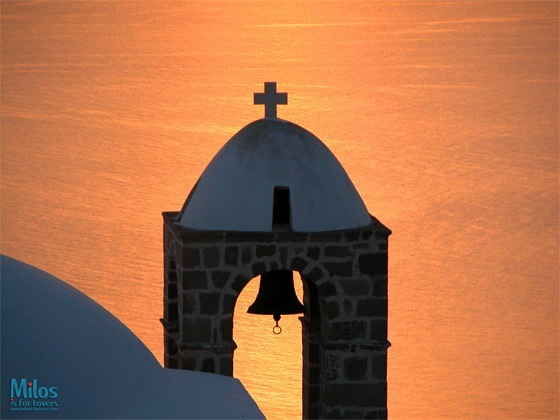 In Milos, several interesting museums (Archaeological, Folklore, Ecclesiastical, Maritime, Mining) are open to visitors, who can also enjoy the island's spectacular landscapes, romantic sunsets, white-washed quaint tiny churches and sugar-cube houses, and incredible local as well as Greek traditional food. Milos island is also very popular because of its multitude ( more than 70) and diversity of beaches, more than any other island in the Cyclades. 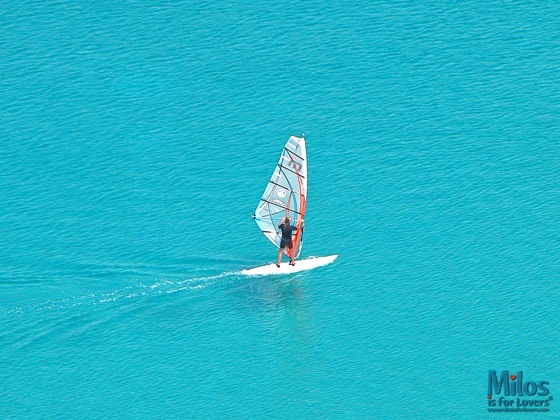 Milos Island is ideally suited for outdoor activities such as sea-kayaking, scuba diving, sailing, mountain bicycling, trekking, distance swimming and windsurfing in the island's protected bay, one of the largest and safest natural harbors in the Mediterranean. The last few years Milos Island is becoming increasingly popular as a wedding and honeymoon destination as well.